CAMIBOX® is a professional modular system solution for wireless image transfer within the licence-free band designed for outdoor application. For supply and installation of a CCTV system please go to: Information for consumers. The system is able to transmit data from a large number of IP cameras to a single recording device in small as well as large and segmented company facilities. Thanks to its variability and easy extensibility it is often used also as part of city CCTV systems. Its installation does not require any previous knowledge of data transmission in LAN networks. Therefore, CAMIBOX® can also be employed by companies that have installed CCTV systems that are based on analogue transmission. Control unit "M" fixed to a building, including a recording device. Arbitrary number of client units "C" to which cameras are connected. If these are not in direct view, "S" units are employed, serving as relay or connecting network points. A detailed description of all the elements is included in individual product sheets. The system is supplied pre-configured according to customer’s brief specifications. It only needs to be installed and connected to IP cameras using an accompanying diagram. Location of the individual wireless connections during activation is facilitated by acoustic signalization of the signal quality. The resulting infrastructure allows for transmission of any type of IP data. This means that in addition to camera images, the network is able to transmit two-way audio, commands for Speed-Dome cameras or state values from sensors, etc. The correct design of an IP camera system requires only the support of the selected camera type with a recording device, and sufficient network throughput depending on the number of cameras while maintaining the required quality of image. CAMIBOX® is intended for outdoor use, the units are fully resistant to European weather conditions and temperatures and they do not require any additional covers or heating. The units are powered by means of the so-called Power Over Ethernet from a distribution network, batteries or solar panels. Maximum security, i.e. double security, of information transmission is ensured. The wireless transmission log is proprietary and at the same time provided with a strong encryption. It is therefore almost impossible for an unauthorized person to hack the wireless transmission and obtain the image transmitted. CAMIBOX® data capacity is above standard. The recording device can be regularly fed with real data of 30-60 Mbps which allows for the transmission of continuous high-quality image from several cameras or standard quality image from a larger number of cameras. Solutions using CAMIBOX-M4 and higher can supply the recording device continuously with more than 120 Mbps and they can meet the requirements of extensive installations comprising dozens of cameras. 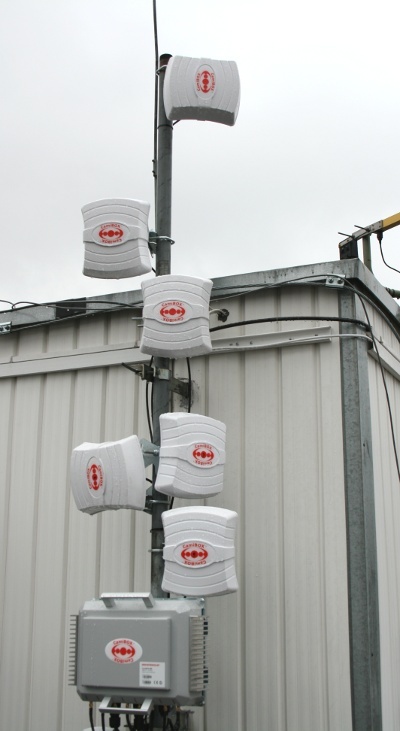 The range of individual wireless connections between the units covers hundreds of meters and it is sufficient for most applications, even in large facilities. 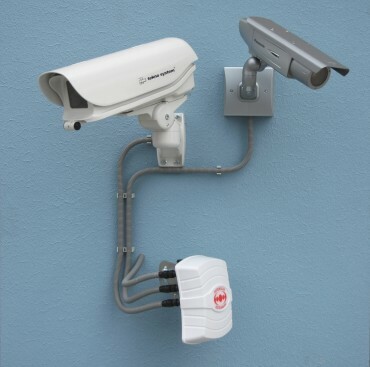 City CCTV systems, which are able to monitor rather large areas, i.e. 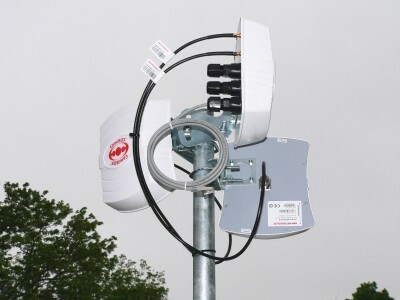 its individual connections exceed hundreds of meters, are complemented with additional cameras that, depending on their individual types, allow for connections covering dozens of kilometres. The system can also be rented, which is usually done by construction companies, providing for fast and cheap security of their entire construction sites for a temporary period of several weeks or months. Rentals with prospective purchase are arranged by companies that offer to their customers the possibility to test the entire solution in practice before purchasing the system and thus help them decide whether to employ it or not. Extra servicing can be ordered together with the system if customers require maximum availability of the service. This servicing ensures that in case a failure is reported a replacement for the fault unit is delivered to the site within several hours. By including CAMIBOX® in your projects you will ensure easy and quick installation as well as the satisfaction of your customers, who will be provided with a system which is seemingly impossible or difficult to implement. Please see the Presentation for more information. Do you want to find out more about CAMIBOX? Do you provide installations or sell CCTV systems? Answer all your questions that have not been addressed in the CAMIBOX presentation. Provide further information and promotional materials. Do you want to see the system in operation? You can request a demonstration to try out the system for yourself and to test its compatibility with your existing cameras. Simply send us a situation plan of your premises marking the locations of the cameras and the recording device. We will arrange a visit to one of our customers using the system close to your location. You will be able to see the entire system in actual operation. We look forward to your questions and requests. Contact one of our sales representatives and ask for assistance in searching for a supplier of the complete CCTV system. please inform your supplier of the possibilities and facilities provided by the CAMIBOX system. The resulting solution will be robust, efficient and economical thanks to low time-consuming installation.